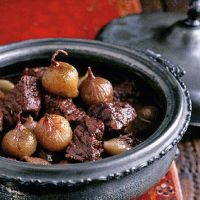 This delicious winter stew takes a long time to cook but does not need watching. It’s only the peeling of the shallots that is time-consuming – and it’s worth the effort. Allspice, wine and vinegar provide a rich, hearty taste. Serve it with crusty bread, plain rice or boiled or mashed potatoes. Put the shallots in a bowl, cover with freshly boiled water and leave for 2–3 minutes; this will make peeling easier. When they are cool enough to handle, drain and peel them. Put all the remaining ingredients in a large casserole and add enough water to cover. Bring to the boil and remove any scum from the surface. Simmer with the lid on, over a low heat, for about 2 hours, until the meat is tender. If necessary, top up with water during cooking to ensure that the meat remains covered. The Corker recommends- Greek red not only gives you a taste of the warm, rocky soil and languid summer sun, it also delivers the intrinsic structure and authority of cabernet sauvignon.